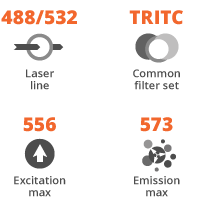 TAMRA Azide, isomer 5 (also known as Tetramethylrhodamine 5-Carboxamido-(6-Azidohexanyl)) is the orange-fluorescent probe that is compatible with various excitation sources including mercury arc, tungsten and xenon arc lamps, the 544 nm line of the Helium-Neon laser and the 532 nm green laser line. It is predominantly used for detection of terminal alkyne-tagged biomolecules via a copper-catalyzed click reaction (CuAAC). It also reacts with strained cyclooctyne via a copper-free “click chemistry” reaction to form a stable triazole and does not require Cu-catalyst or elevated temperatures. For the detection of low abundance targets or where significant increase in signal intensity is desired please consider using next generation azides probes containing an internal copper-chelating motif. TAMRA Azide, isomer 5 is structurally is identical to Invitrogen’s (Thermo Fisher Scientific) Tetramethylrhodamine (TAMRA) Azide (Tetramethylrhodamine 5-Carboxamido-(6-Azidohexanyl)), 5-isomer (Catalog number: T10182). 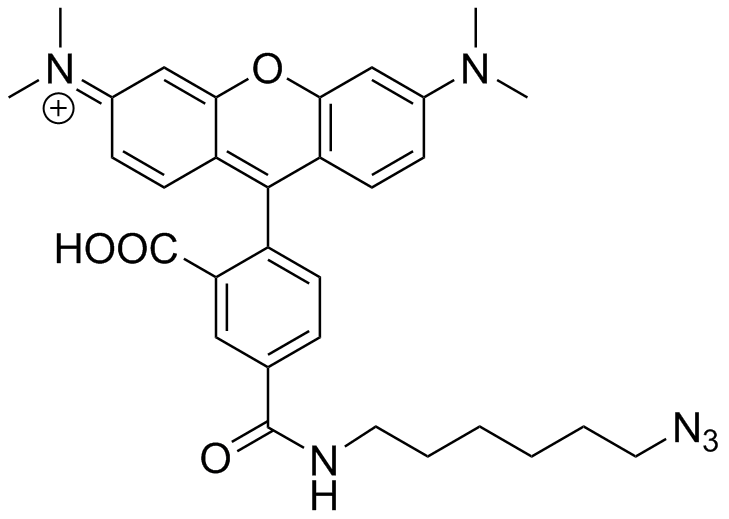 A water-soluble, bright, green-emitting dye used for imaging low abundance alkyne-containing targets. A bright and photostable green fluorescence-emitting probe with superior kinetics in copper-catalyzed click reactions. 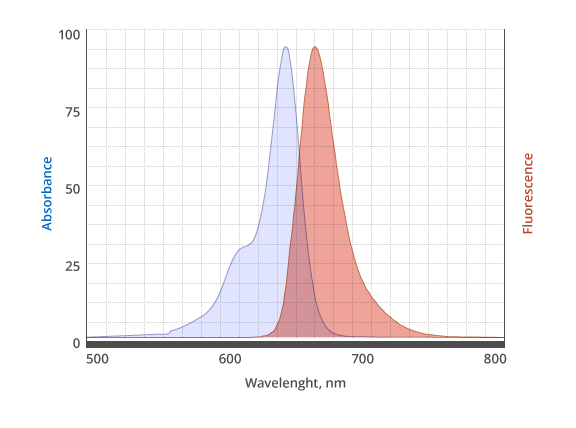 An azide-activated, water-soluble red-fluorescent probe used with the Ar-Kr mixed-gas laser. A bright and photostable red-fluorescent probe with superior kinetics in copper-catalyzed click reactions.